Have you opened the web browser and found a previously unseen site called Chromesearch1.info? If you answered ‘Yes’ then your need to know that your web-browser has become the victim of hijacker. It’s a type of harmful software that changes the machine’s browser settings so that you’re redirected to an unwanted page. Follow the few simple steps below ASAP to get rid of Chromesearch1.info redirect and stop the ability to penetrate of more dangerous viruses and trojans on your computer. The browser hijacker, which set the Chromesearch1.info as your startpage can also set this annoying web-site as your search engine. You will encounter the fact that the search in the web browser has become uncomfortable to use, because the search results will consist of a large amount of advertisements, links to ad and unwanted web pages and a small amount of regular links, which are obtained from a search in the major search engines. Therefore, look for something using Chromesearch1.info site would be a waste of time or worse, it may lead to even more infected system. The Chromesearch1.info hijacker can alter some settings of installed web-browsers, but often that the unwanted software may also infect all types of internet browsers by changing their desktop shortcuts. Thus forcing the user to see Chromesearch1.info unwanted page every time launch the browser. Some browser hijackers also contain adware (sometimes called ‘ad-supported’ software) that may be used to display unwanted advertisements and or collect lots of personal data that can be used for marketing purposes. These unwanted ads can be shown in the form of pop-unders, pop-ups, in-text advertisements, video advertisements, text links or banners or even massive full page ads. Most of the ‘ad supported’ software is created to display ads, but some adware is form of spyware that often used to track users to gather user information. We recommend you to free your computer as soon as possible. Use the few simple steps below which will allow to remove Chromesearch1.info search and adware, that can be installed onto your personal computer along with it. The answer is right here on this web page. We have put together simplicity and efficiency. It will help you easily to free your system of hijacker. Moreover, you can choose manual or automatic removal method. If you are familiar with the computer then use manual removal, otherwise use the free antimalware utility designed specifically to remove browser hijacker infection like Chromesearch1.info. Of course, you can combine both methods. Read this manual carefully, bookmark or print it, because you may need to close your web browser or restart your computer. Most common browser hijackers may be removed without any antivirus software. The manual hijacker removal is blog post step-by-step instructions that will teach you how to remove the Chromesearch1.info . Some of the steps below will require you to close the web-page. So, please read the steps carefully, after that bookmark or print it for later reference. Some potentially unwanted programs, browser hijacking applications and adware may be removed by uninstalling the free software they came with. If this way does not succeed, then looking them up in the list of installed programs in Windows Control Panel. 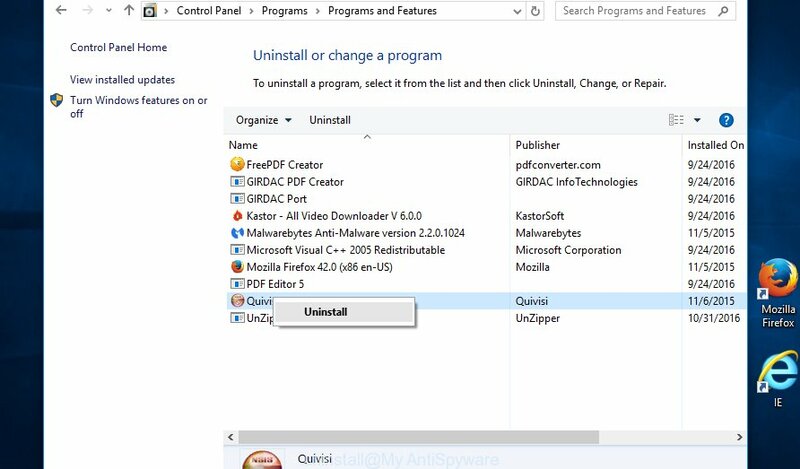 Use the “Uninstall” command in order to remove them. Very carefully look around the entire list of software installed on your PC. Most likely, one or more of them are responsible for the appearance of popup ads and web-browser redirect to the unwanted Chromesearch1.info web page. If you have many programs installed, you can help simplify the search of malicious programs by sort the list by date of installation. 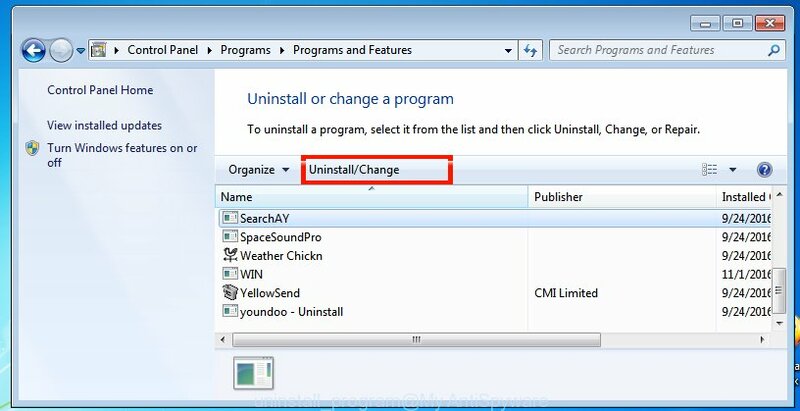 Once you have found a suspicious, unwanted or unused program, right click to it, after that press ‘Uninstall’. You will see a list of software installed on your PC system. We recommend to sort the list by date of installation to quickly find the applications that were installed last. Most likely they responsibility for the appearance of pop-up ads and web-browser redirect. If you are in doubt, you can always check the program by doing a search for her name in Google, Yahoo or Bing. When the application which you need to remove is found, simply press on its name, and then press ‘Uninstall’ as shown on the screen below. Click the right mouse button to a desktop shortcut which you use to run your web browser. Next, select the “Properties” option. Important: necessary to click on the desktop shortcut for the internet browser which is redirected to the Chromesearch1.info or other annoying web-page. If you are seeing an unknown text like “http://site.addres” which has been added here, then you should remove it, as shown in the figure below. Next, click the “OK” button to save the changes. Now, when you launch the browser from this desktop shortcut, it does not occur automatically redirect on the Chromesearch1.info site or any other unwanted pages. Once the step is complete, we recommend to go to the next step. 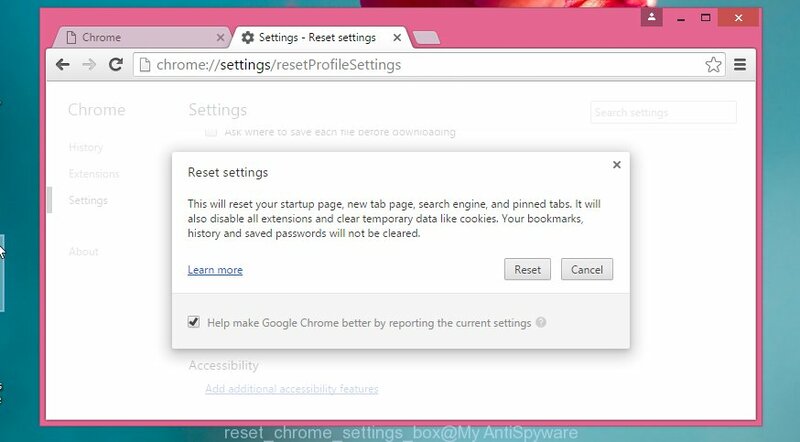 Reset Google Chrome settings is a easy way to remove the browser hijacker, harmful and adware extensions, as well as to restore the internet browser’s homepage and search engine by default that have been modified by browser hijacker. The Google Chrome will open the reset settings dialog box as shown on the image above. The Mozilla Firefox reset will keep your personal information like bookmarks, passwords, web form auto-fill data and remove unwanted search engine and startpage like Chromesearch1.info, modified preferences, extensions and security settings. Run the FF and click the menu button (it looks like three stacked lines) at the top right of the web-browser screen. Next, press the question-mark icon at the bottom of the drop-down menu. It will open the slide-out menu. Click the “Refresh Firefox” button at the top right of the Troubleshooting Information page. Select “Refresh Firefox” in the confirmation dialog box. The Firefox will start a task to fix your problems that caused by the Chromesearch1.info browser hijacker. Once, it’s finished, press the “Finish” button. To restore the homepage, new tab and default search engine you need to reset the Internet Explorer to the state, which was when the Microsoft Windows was installed on your computer. First, start the IE. Next, press the button in the form of gear ( ). It will show the Tools drop-down menu, press the “Internet Options” as on the image below. In the “Internet Options” window click on the Advanced tab, then press the Reset button. The Microsoft Internet Explorer will open the “Reset Internet Explorer settings” window as shown on the screen below. Select the “Delete personal settings” check box, then click “Reset” button. Manual removal is not always as effective as you might think. Often, even the most experienced users can not completely remove browser hijacker from the infected PC. So, we recommend to check your machine for any remaining malicious components with free browser hijacker removal programs below. 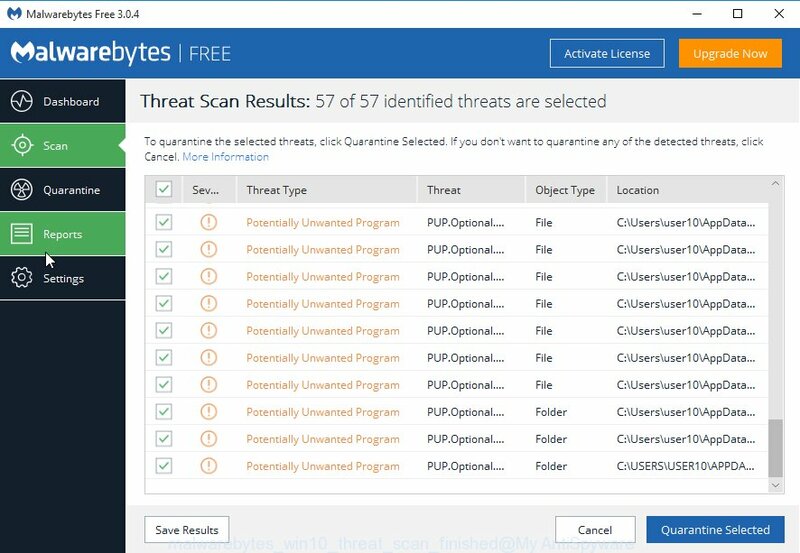 We suggest using the Malwarebytes Free that are completely clean your personal computer. The free tool is an advanced malware removal program developed by (c) Malwarebytes lab. This application uses the world’s most popular antimalware technology. It’s able to help you remove browser hijackers, PUPs, malware, adware, toolbars, ransomware and other security threats from your machine for free. Once downloaded, close all applications and windows on your system. Open a directory in which you saved it. Double-click on the icon that’s named mbam-setup as shown on the image below. Now press the “Scan Now” button to perform a system scan for the browser hijacker infection . This procedure can take quite a while, so please be patient. While the utility is scanning, you can see number of objects and files has already scanned. When the scan is finished, the results are displayed in the scan report. Next, you need to click “Quarantine Selected” button. The Malwarebytes will begin removing Chromesearch1.info browser hijacker related files, folders, registry keys. Once disinfection is complete, you may be prompted to reboot your computer. The following video explains instructions on how to remove browser hijacker with Malwarebytes Anti-malware. This removal application is free and easy to use. It can scan and delete browser hijacker such as Chromesearch1.info, malware, potentially unwanted applications and adware in Chrome, FF, Edge and IE web browsers and thereby revert back their default settings (homepage, new tab page and search engine by default). AdwCleaner is powerful enough to find and get rid of malicious registry entries and files that are hidden on the machine. Once downloading is finished, run the AdwCleaner, double-click the adwcleaner_xxx.exe file. In the AdwCleaner window, press the “Scan” to perform a system scan with this utility for the Chromesearch1.info browser hijacker infection which reroutes your browser to the Chromesearch1.info unwanted site. Depending on your computer, the scan can take anywhere from a few minutes to close to an hour. During the scan it’ll detect all threats present on your computer. When it completes the scan, it’ll show you the results. In order to remove all items, simply click “Clean”. If the AdwCleaner will ask you to restart your PC, press “OK”. It is also critical to protect your web-browsers from malicious web sites and advertisements by using an ad blocking application such as AdGuard. Security experts says that it’ll greatly reduce the risk of malware, and potentially save lots of money. Additionally, the AdGuard can also protect your privacy by blocking almost all trackers. Once the downloading process is done, run the downloaded file. You will see the “Setup Wizard” screen as shown on the screen below. Follow the prompts. Once the installation is done, you will see a window as on the image below. In most cases, the default settings are enough and you do not need to change anything. Each time, when you launch your personal computer, AdGuard will start automatically and block popup ads, sites such Chromesearch1.info, as well as other malicious or misleading web-pages. For an overview of all the features of the program, or to change its settings you can simply double-click on the AdGuard icon, which is located on your desktop. After completing the steps above, your PC system should be clean from malware and browser hijackers. The Google Chrome, FF, Edge and IE will no longer open Chromesearch1.info unwanted home page on startup. Unfortunately, if the step-by-step guide does not help you, then you have caught a new browser hijacker, and then the best way – ask for help. Wait for one of our trained “Security Team” or Site Administrator to provide you with knowledgeable assistance tailored to your problem with the annoying Chromesearch1.info .